A new prize competition is available seeking innovative methods and technologies to detect leaks and flaws in large pipe. Detecting leaks and flaws early is the key to solving this problem and preventing the loss of valuable and scarce water resources. An example of a pipe that Reclamation is seeking innovative methods and technologies to detect leaks and flaws. A new prize competition is available seeking innovative methods and technologies to detect leaks and flaws in large buried pipelines that deliver water for municipal, industrial, and agricultural uses. The Bureau of Reclamation has launched a new prize competition seeking innovative methods and technologies to detect leaks and flaws in large buried pipelines that deliver water for municipal, industrial, and agricultural uses. 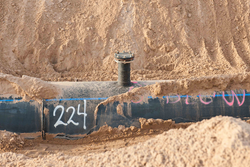 Currently, no practical method exists to detect leaks and flaws in large diameter pipelines. For example, leaks in pipes delivering treated drinking water result in billions of gallons of water lost annually - an amount that could fill more than three million Olympic-size swimming pools. Detecting leaks and flaws early is the key to solving this problem and preventing the loss of valuable and scarce water resources. This competition is focused on steel pipe and prestressed concrete cylinder pipe with diameters greater than 48 inches. However, proposed solutions that can be applied to all size and type of pipelines in a wide variety of uses will be considered. Proposed solutions must be cost-effective and scalable to pipelines with lengths of approximately 100 miles. Winning solutions that meet these criteria could have potential benefits not only to Reclamation and its water users, but to state and local municipal water utilities and customers. This prize competition will consist of two stages. Stage one is a theoretical challenge that requires a written proposal. Reclamation is making a total prize purse of $75,000 available, to be divided by up to five winners. If successful, stage two is planned to provide proof-of-concept in a laboratory-scale demonstration. Submissions to this competition must be received by May 8, 2018 at 11:59 PM EDT. Late submissions will not be considered. Reclamation is partnering with the San Diego County Water Authority, Southern Nevada Water Authority, and Isle Utilities for this competition.